Barbara Samuel's enjoyable novel, The Goddesses of Kitchen Avenue, weaves together the lives of four very different women, each grappling with issues of career, love, and life. The women, all neighbors on a quiet street in Pueblo, Colorado, grow to be each other's friends and supporters as their lives intersect. Trudy, the main narrator of the novel, is struggling to put her life back together and rediscover her identity after learning that her husband of twenty-plus years is having an affair. Her next-door neighbor, Roberta, has just lost her beloved husband after sixty-two years of marriage. Roberta's beautiful granddaughter, Jade, turns to boxing as a release from conflicting emotions after divorcing her con-man husband. Shannelle,a young mother and aspiring writer, lives across the street and is trapped between her dreams and financial reality. Samuel uses unique approaches to invite the reader into each woman's life. She alternates between the four women's perspectives in separate chapters. Roberta's story is told mainly through letters she writes to her sister, and we view Shannelle's struggles through the e-mails she sends to her writing mentor. Trudy's and Jade's voices are heard through more traditional first-person narration. Each chapter is headed by quotes that reflect that character's values: inspirational quotes from Shannelle's writing wall, Roberta's favorite bible passages, facts about women's boxing from Jade, and Trudy's excerpts of Spanish poetry and references to mythical goddesses. While I enjoyed the constant change of perspective, readers who prefer a more traditional narrative may find it a bit distracting. The interwoven stories and happy endings have an idealistic tendency, but Samuel's warm, well-drawn characterizations made the women seem real. By the end of the book, I felt like the characters were familiar friends and was pleased to see them learn, grow, and unravel the knots of their troubles in their own unique ways. I happen to like happy endings. 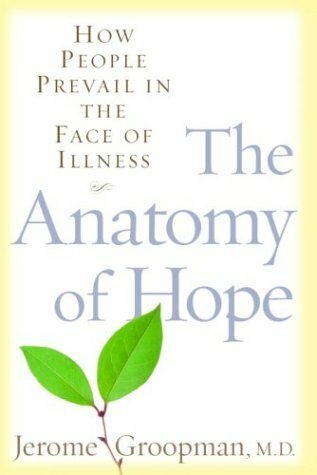 Looking for comfort and inspiration during a relapse of my illness this week, I turned to The Anatomy of Hope: How People Prevail in the Face of Illness by Dr. Jerome Groopman. I found just what I needed in this fascinating exploration of hope. Much of the book reads like a novel, as Dr. Groopman shares stories of his patients and his own 20-year struggle with severe back pain. He tells of a devout Orthodox Jewish woman who was convinced her breast cancer was a punishment from God, of a veteran who refused treatment for a very treatable cancer, and of the miraculous recovery of a pathologist stricken with one of the deadliest cancers known. Each story sheds light on his growing understanding that hope can be a powerful force in recovery -- something not taught in medical school. Woven throughout these compelling stories, Dr. Groopman humbly admits to his own shortcomings as a doctor and shows how each patient contributed to his eventual enlightenment as to the power of hope. "Hope is the elevating feeling we experience when we see - in the mind's eye - a path to a better future. Hope acknowledges the significant obstacles and deep pitfalls along that path. True hope has no room for delusion." Toward the end of the book, Dr. Groopman also takes a look at the scientific side of hope, reviewing what little research exists and recounting his discussions with various experts. Having a scientific background, I appreciated this link to science to further prove that what Dr. Groopman observed in his patients can be backed up by data and isn't just another "think yourself well" platitude. Despite his obvious excitement about the power of hope,he puts it in perspective as just one element that can contribute to wellness and recovery. The Anatomy of Hope successfully combines compassion and science in a book that is both inspirational and practical. Dr. Groopman's considerable talents as a writer and storyteller wrap these important lessons in an engaging view of the medical world that patients rarely see. Just reading his book makes me feel more in control of my illness and more hopeful for my future.